The American economy had a smooth summer. Gross domestic product increased 3.5% between July and September, according to the U.S. Commerce Department. It exceeded analysts' expectations and offered more proof of an economy gaining momentum. "This is a good number," says Jay Bryson, global economist at Wells Fargo Securities in Charlotte, N.C. "The economy has a fair amount of momentum." Analysts had only projected GDP growth to hit 3% this quarter, according to data from FactSet. The GDP report reflects a widely held view that employment is picking up. More jobs means higher incomes and spending, economists say. Consumer spending is the largest factor for U.S. economic growth, and it rose 1.8% in this quarter, a slight drop from the same time a year ago, but better than the bleak first quarter this year. The GDP report shows some bright spots. Government spending, often lagging behind in the recovery, hit its highest quarterly mark since 2009. Exports also showed a healthy gain in the third quarter compared to the same time a year ago. "When you look at the underlying pace of the economy, we should continue to see solid numbers going forward," says Bryson. "The government won't be a drag on growth." 2014 had a dicey start. Economic growth dropped 2.1% the first quarter because the extremely cold winter (remember the Polar Vortex) kept many businesses and schools closed for days and people inside their homes. The weather also lowered exports to other countries. 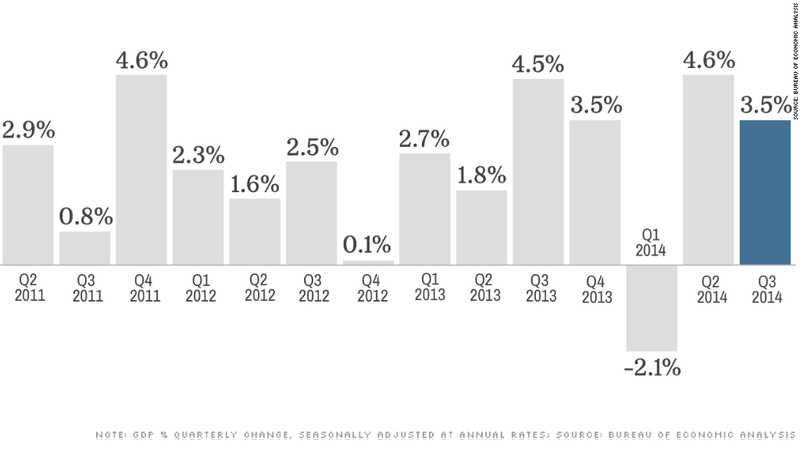 Second quarter GDP rebounded well, posting 4.6% growth from the same time a year ago. The GDP news comes on the heels of the Federal Reserve's announcement Wednesday to end its bond-buying stimulus program now that the economy is improving. Economists viewed the Fed's decision as a mostly positive sign that growth is picking up, even in the job market. What's next? The IMF forecasts that the U.S. will have 2.2% GDP growth for the year. So far, the nation appears to be on track for that. It's a lot higher than Europe and other parts of the world that have been hit by geopolitics and slowing growth such as Russia. Europe's slowdown could also be a drag for the U.S., although so far the impact has been modest. "I think Europe by itself poses no real threat to the U.S. recovery or expansion," said Dr. Robert Shapiro, former Under Secretary of Commerce for Economic Affairs. The big concern for next quarter is holiday spending. Americans are clearly buying more, but it's still not a level investors and economists want to see to feel confident that the worst is behind. Falling oil prices could help shoppers and savers. The majority of Americans now have under $3 a gallon gas. Although prices might adversely affect oil-producing states, they're a good sign for most, says Jeremy Lawson, chief economist at asset management firm Standard Life Investments. "There will be some states that are disadvantaged by oil prices," says Lawson, "but for the overall economy it is a positive."